Details: 1969 Cadillac Model 75. 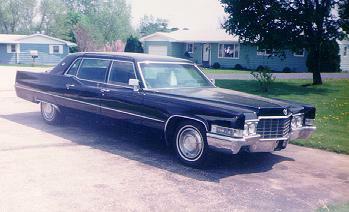 7 passenger formal limousine. Formerly owned by ex-Texaco tycoon, Lester Norris (Norris *****, Norris Stadium, etc.) Black with no vinyl top, black leather front seat with gray brocade interior. 2 a/c systems, 2 radios, much more. $9000 spent on major refurbishing 10 years ago. Professional black repaint now starting to show cracks. Chrome and interior are gorgeous. All reasonable offers considered. Trades welcome. Layaway terms available up to 24 months with only 10% down. All cars sold "as-is, where-is." This vehicle has been viewed 2722 times.